This year, the Association of Southeast Asian Nations (ASEAN) and India are celebrating 25 years of dialogue, 15 years of summit level meetings, and five years of strategic partnership. India’s relationship with ASEAN has improved to the extent that the regional grouping is now the anchor of India’s Act East policy. Today, India has 30 sectoral dialogue mechanisms and seven ministerial level interactions with ASEAN, in fields such as external affairs, defense, connectivity, commerce, telecommunications, agriculture, energy, environmental issues, and tourism. India also shares strong bilateral relations with each of the 10 ASEAN member countries. But the relationship between ASEAN and India has not always been close. India throughout the Cold War was not in favor of involvement in regional organizations, preferring to focus on active participation in global organizations. Apart from this, the geopolitics of the Cold War placed ASEAN and India in opposing ideological blocs. The formation of ASEAN itself was viewed by India as a U.S. measure to contain communism, which was on the rise due to the spillover from the Vietnam War. A series of Indian moves created fissures in the already tense ASEAN-India relationship: India’s friendship treaty with the Soviet Union in 1971, its stance on the Vietnam War, its recognition of Hang Samrin’s regime in Kampuchea (Cambodia), its selective silence on the Soviet’s invasion in Afghanistan and vehement criticism of the American presence in Diego Garcia, India’s Peaceful Nuclear Explosion of 1974 and its military (especially naval) modernization in the 1980s. ASEAN and India did converge on the issue of the Zone of Peace, Freedom and Neutrality (ZOPFAN) in the Indian Ocean Region (IOR) and India had modest bilateral relations with a selected few ASEAN countries in the economic sphere. But throughout the Cold War, ASEAN-India relations were dominated by tensions and mutual suspicion on both sides. The story of ASEAN-India relations throughout the Cold War can be appropriately summarized as missed opportunities due to political mistrust, economic inconsequentiality, and occasional military threats. However, changes in the structural factors — like the fall of the Soviet Union, the rise of the parallel forces of globalizations and regionalization, the rise of the People’s Republic of China (PRC), the Asian Financial Crisis, and the 9/11 attacks — changed India’s perception regarding the value of regional organizations. Worsening security conditions and isolation at the international level, alongside the rising balance of payment crisis which India faced in 1991, compelled New Delhi to move from its recalcitrant approach to active engagement with regional organizations. Prime Minister Narasimha Rao’s visit to select Southeast Asian countries marked the beginning of India’s Look East policy, with the ASEAN at the center. In 1992, India became a dialogue partner across limited sectors in ASEAN; it achieved the status of full dialogue partnership in 1995. The next year, India was given the opportunity to appear in the ASEAN Post Ministerial Conference (PMC) and became a full member of the ASEAN Regional Forum (ARF). Membership in ARF gave India the chance to share a high table with big powers like the United States, China, and Russia, alongside ASEAN, on security issues in the Indo-Pacific region. Since then, ASEAN-India relations have continued to mature, apart from the brief period of 1997-2001, when events like India’s nuclear tests and the Asian Financial Crisis of 1997 saw a marginal dip in engagement. Today the ASEAN and India annual summit is in its 15th year. ASEAN and India celebrated a “commemorative summit” in 2012 where relations were upgraded to a strategic partnership. Issues concerning economics, security, and connectivity have always been at the center of ASEAN-India relations. In the year 2016-17, ASEAN accounted for around 10.4 percent of India’s exports and 10.6 percent of India’s imports. Over the past 20 years, ASEAN’s portion of India’s total exports and imports is around 9.22 percent and 8.93 percent, respectively, which is a considerable chunk. India signed a free trade agreement in goods in 2009 and an FTA in services and investments in 2014 with ASEAN. Apart from this, India has a Comprehensive Economic Cooperation Agreement with various countries of the ASEAN region. This has resulted in concessional trade and a rise in investments; around 10 percent of the total FDI equity inflows to India comes from the ASEAN region. On the security issues, inclusion in ARF was a major positive for India, which missed out on a permanent seat on the UN Security Council. Over recent years, ASEAN and India have seen their interests converge on the issue of nontraditional security in the IOR. Countries of the IOR have repeatedly suffered due to the rise in piracy, illegal migration, and trafficking of drugs, arms, and human on the trans-national level, as well as maritime terrorism. ARF allows India to discuss these issues, which are of immediate concern and can be only resolved on a multilateral level. India has also scored several diplomatic successes at ARF, including maintaining ties after its nuclear test of 1998, isolating Pakistan during the Kargil War, and lobbying against Pakistan’s entry in the forum till 2002. Apart from the ARF, the ASEAN PMC and the ASEAN Defense Ministerial Meeting-Plus (ADMM-Plus) provide a platform for India and ASEAN to deliberate on the security issues concerning this region. Measures like the signing of a “Joint Declaration for Cooperation to Combat International Terrorism,” maritime exercises with the navies of ASEAN countries, information-sharing initiatives, and defense agreements with individual ASEAN countries have added a new dimension to ASEAN-India relations. Connectivity is another important issue of convergence between ASEAN and India, with India working toward formalizing its transit agreements and establishing better connectivity infrastructure with this region through land, water, and air. Relations have also visibly developed in other areas like education, tourism, academic, cultural, social, and scientific cooperation. 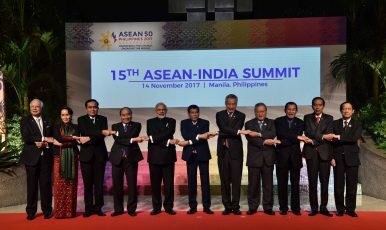 The “ASEAN-India Partnership for Peace, Progress, and Shared Prosperity” in 2004 and the “Plan of Action” in 2012 highlighted the growing confluence in various areas between ASEAN and India. Today, three-and-a-half-years into his term, Indian Prime Minister Narendra Modi has already visited eight out of ten ASEAN countries and gives prime importance to the ASEAN-India summit. This reflects the strategic importance of this region in India’s foreign policy approach. The upgrade from the Look East to Act East policy with the ASEAN at the core was among the earliest initiatives of the Modi government. The rise of China has compelled India to put forth its best efforts to engage with ASEAN as a regional grouping. The ASEAN countries have always looked to India for balancing against China, but India has consistently disappointed them. For India to be a regional power as it claims to be, continuing to enhance its relations with ASEAN in all spheres must be a priority. In this age of multilateral alignment, the geopolitics of the Indo-Pacific region will either be defined by India’s engagement and cooperation with ASEAN and the like minded countries, or by a rising China’s expansive unilateralism in the Indo-Pacific region. Suyash Desai is a PhD Scholar in the Center for International Politics, Organization and Disarmament (CIPOD), Jawaharlal Nehru University. India's plan for its relations with ASEAN were on display at the recent Delhi Dialogue.